The double-wall thermal insulation of the skybar Wine Cool Cover keeps pre-chilled wine cool for hours. Photo from skybar Web site. WE’VE all been there before. The wine-cooling dilemma: to chill and drip-drip-drip or to keep dry, eventually warming the wine, especially if a fireplace is nearby. Absolutely maddening. Completely wrecks the whole purpose of opening a bottle of wine to relax in the first place! Find relief in the perfect marriage of elegant form and fine function with the skybar Wine Cool Cover (on sale online for $39.99). The sleek, double-insulated aluminum sleeve fits snuggly over a chilled bottle of bubbly or wine, keeping it frosty for hours. Literally. No more wet patches all over the holiday linens. No more jarringly frozen fingers grasping slippery bottles. 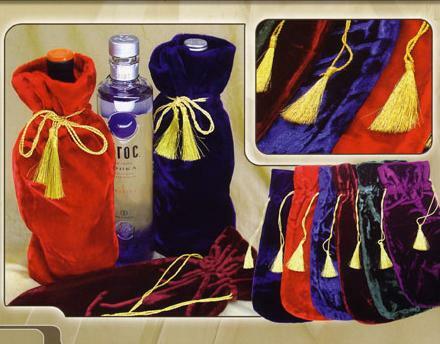 The gold-tasseled velvet wine bag comes in six colors. Photo from Way More For Less Website. 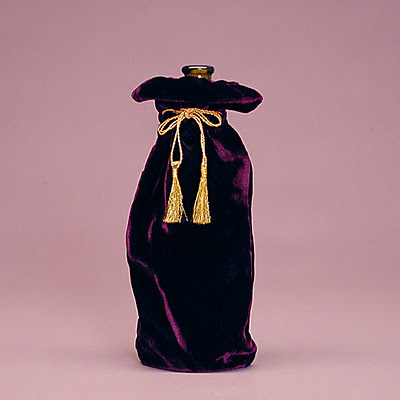 A velvet wine bag harkens back to a time when wrapping was as significant as the gift itself, and was never, ever made of paper. Explore the world of velvet, that noble winter wrap. Lower a bottle inside, and watch the transformation take place, as if by magic. The thick dark velvet wine bag’s cord winds securely around the bottle, a glint of gold dangling along the shapely silhouette, mysterious and seductive. People nod and smile at an upright velvet sack, held up by nature or a special force from within. Soon their eyes begin to tell another story. Is that for me? What could possibly be inside? Only one hand will extend the richly encased treasure. Only one other hand will greet it. The fingers will brush against the plush softness. A gentle caress will ripple along the palm. The weight of the bottle will recall the hand from its daydream, as it grips the softened glass. For a while, all is still. Suspense lurks. The wine (or spirits) inside must be special to merit such careful presentation. The velvet bag is a pleasing package in which to present a bottle of wine or liquor. Photo from Way More For Less Website. Fearful that the bag might cost as much as the wine? Not to worry. This little find is a best kept holiday secret ($11, including shipping). It’s also available in six colors: royal blue, purple, red, plum, burgundy, and hunter. Shhhhh – tell no one. Just between you and Vevlyn. Happy Holidays! to learn more about the skybarTM Wine Cool Cover, and http://http://www.skybarhome.com/Product.aspx?pid=7027 to learn more about the velvet wine bag.